Local welding stores are a great resource for welding equipment and welding supplies that can be obtained at short notice but what if there is no local welding stores? What do you do when you live in a regional area and there is no local welding supplier? Traditionally you would need to travel to the next large town and pay a premium for the priviledge of sbuying a welder in the only welding shop within the town. Thankfully the inetrnet has created a shortcut, no need to do anything more than click a button and wait. Wait??? Wait for what? Well, simply wait for your order from Tokentools to arrive. Unlike traditional bricks and mortar business’, Tokentools is an online welding supply store and a traditional bricks and mortar business also. Tokentools has a proven track record in online sales. We ship orders on the same day that they are received and we can get welders to our customers Australia wide within 1 to 5 days. 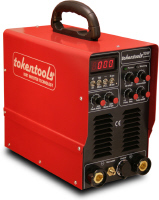 Tokentools has defined Local Welding Shops for a new generation that has switched on to the benefits of getting welders online saving money by comparing prices online and providing the welding industries best welding machine warranty, a whopping 5 years. We sell mainly inverter welding machines, A.K.A Inverter Welders. We have Tig welders, Mig Welders, Arc Welding Machines, Plasma Cutters, Automatic Welding Helmets, Welding Carts, Tig Filler Rods….. the list goes on. Check our online welding supply inventory and start saving money with the benefits of online shopping for welders at Tokentools Welders ad Welding Supplies. Local welding stores are my favourite place to shop. I enjoy online welder purchases too.